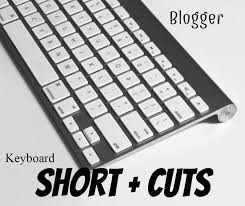 In this article will show you keyboard shortcuts for Blogger post editor.We all know that keyboard shortcuts let us to perform different task without wasting much time and that is the reason we are sharing this list here for you in order to save your time.You can use on Blogger and ease out your work. Ctrl + F It will give you a search which you can use to find any phrase one sentence in your post. Ctrl + Shift + M It will convert your Blogger Post Editor to Mobile View. Ctrl ++ (Press + Twice) It will zoom in the blogger post editor. Ctrl -- (Press - Twice) It will zoom out the blogger post editor. Ctrl + 0 It will change the screen to default size. Ctrl+Shift+V It will paste the copied item without formatting. Tab + Shift It will add levels between bullets and levels, (Use to remove the bullets or numbers). First select the text and then use this shortcut. Tab It will change the bullets into sub-bullets. Crl + K	 It will insert hyperlink to selected text. First select the text and then insert the link into it. Crl + I It will italicize the selected text. First select the text and then use this shortcut. Crl + U It will underline the selected text. First select the specific text and then use this shortcut. Crl + S It will auto-save your post and you can keep on editing at the same time. Crl + A	 It will select the complete page. Ctrl + C It will copy the selected text. Ctrl + V It will paste the coped text. Ctrl + Z It will undo the deleted or erased text. Ctrl + Y It will redo the undo text. Ctrl + X It will redo the undo text.